Today’s guest blog post is provided by Jack Schilling, part of the Iowa AmeriCorps 4-H Outreach program, serving with Water Rocks! in 2017-2018. This month, AmeriCorps Service Members participated in AmeriCorps Week, a week dedicated to raising awareness and promoting AmeriCorps. As a great opportunity to promote the program I have been a part of for six months, I immediately set my sights on my way of promotion: a radio interview in my hometown of Jefferson. The local radio station, Raccoon Valley Radio, was kind enough to do an interview with me about AmeriCorps at my request. I spoke about AmeriCorps, Water Rocks!, and what I enjoyed about both. I even got the chance to talk about why I joined AmeriCorps: I needed more time to figure out what I wanted to do in life, and AmeriCorps seemed like a great use of time in my gap year. As glad as I am to have done my part in promoting AmeriCorps, I wish I could have done more to promote the program for the week. I planned on giving a presentation to my county’s schools about AmeriCorps, but sadly their spring breaks were right over AmeriCorps Week! Nevertheless, I’m happy that I and the other AmeriCorps members were able to reach out and promote AmeriCorps to all who are looking for an opportunity just like this. Today’s guest blog post represents the opinion of AmeriCorps Service Member Jack Schilling, part of the Iowa AmeriCorps 4-H Outreach program, serving with Water Rocks! in 2017-2018. It’s been almost six months since I first started my service with Water Rocks! and Iowa State University. Throughout this time, I have traveled all over the state of Iowa for numerous outreach events, from Decorah to Council Bluffs, Sioux Center to Cedar Rapids. The bluffs and plains of Iowa offer some truly great views along the highways, but there is another sight that has become all-too-familiar to me: the sight of a small, rural, agricultural town along the way. My home town, Jefferson, was not much different than this when I was a child, but in the last few years gained new businesses, most notably a Hy-Vee and the Wild Rose Casino. However, many small towns do not get an opportunity like this and run the risk of fading away. Rural areas on the decline is not a new concept: farm income plunged for three straight years since 2014, says Barbara Soderlin of the Omaha World Herald (American farm income to fall in 2018 according to USDA forecast). A combination of low prices and poor weather have made it rough for farmers trying to get by. Some made the tough decision to give up their family farms simply because it couldn’t provide. And as farm family numbers shrink, so do the number of stores, hospitals, and other places of work. Even the factories, a partner with farms as the great job producers of Iowa’s rural economy, will leave, searching for more workers. And as such, rural Iowa, the lands that we are known for, decay. When you see the same circumstance time and time again, you truly want to help your state find a way to bring jobs, wealth, and prosperity back to how they used to be. And, in a way, it helps you realize why some decisions are made the way they are. At first, it may not make sense for a factory to get a tax credit. But, if they didn’t have the tax incentive, the factory may not have been there in the first place. Bringing one part of the rural economy’s life blood back is a good first step for the state. More jobs lead to more population in the towns, which leads to town necessities like stores, hospitals, and gas stations being built, which leads to more jobs and a better economy. Ideally, this leads to a revitalization of an entire area. But what of the farmers of the state? I can’t give an answer to that. The future of the Iowa farmer is uncertain. Price lulls, poor weather, and a disappearing rural community all factor in to the life blood of the rural economy. Ideally, the price of corn and soybeans will rise again, and the problem will solve itself, but the future lies at a crossroads. Does the small town/rural Iowa we know rebound and thrive again, or does it become the agricultural equivalent of the Rust Belt, a relic of a better time? In case you missed it, this past week’s Iowa Learning Farms webinar offered an excellent overview of the research findings related to the potential of winter cover crops to reduce nitrate leaching in corn and soybean cropping systems. Dr. Tom Kaspar, plant physiologist with the USDA-Agricultural Research Service, shared results from numerous studies that show the ability of cover crops to reduce nitrate concentrations and loads in tile drainage water. The press headlines about nitrates and water quality are seemingly ubiquitous, and Kaspar provided solid data that help to paint a complete picture of the challenges and opportunities. Our land uses have changed dramatically, and over the past 60-70 years, our cropping systems have likewise changed dramatically with significant reductions in small grains, hay and perennial vegetation. With corn and soybeans having a 7-month brown gap when they are not actively uptaking nutrients, that leaves a significant amount of time with nutrients vulnerable to leaching. However, Kaspar’s research clearly demonstrates that cover crops help transition that brown gap to a green gap, providing the ability to “capture” nutrients in the soil that would otherwise be vulnerable to leaching loss. One of Kaspar’s long-term research studies in central Iowa found that rye cover crops in a corn-soybean cropping system reduced nitrate concentrations in tile drainage water by 57%. Additional studies by Kaspar and collaborators around the state found nitrate reductions of anywhere from 20% to 40%. This variability is expected, with different amounts of cover crop growth, weather, rainfall, soil types, tile systems, and field histories. Kaspar also pointed out that it takes quite some time for nitrate to move through the system – there is a noticeable lag effect. For instance, Kaspar and collaborators found that nitrate concentrations in subsurface tile drainage continued to decrease through the summer, long after spring cover crop termination. 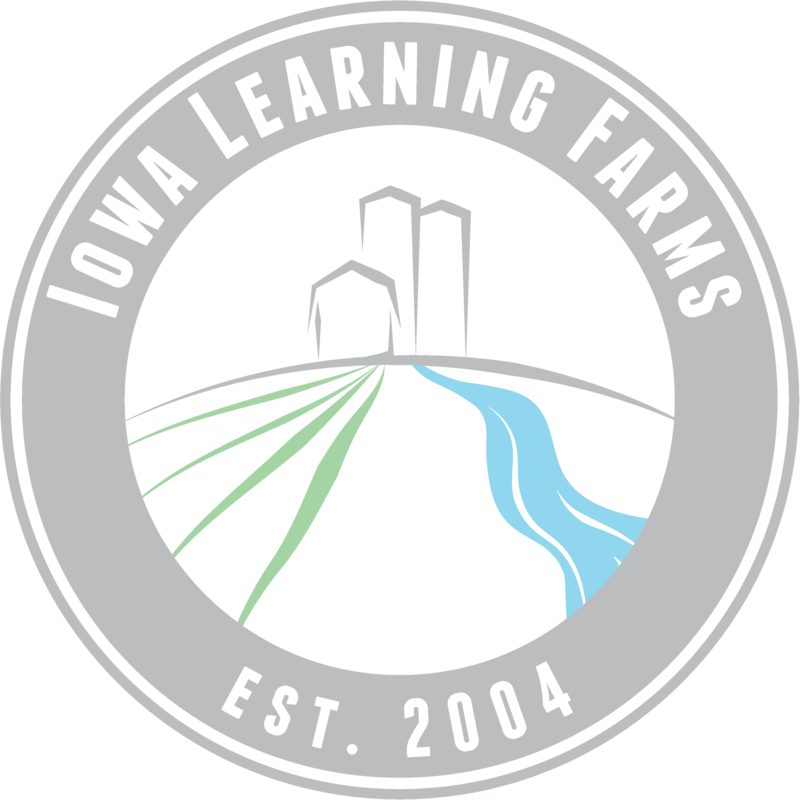 Check out the full webinar, Lessons Learned from Using Cover Crops to Reduce Losses of Nitrate for 15 Years, on the Iowa Learning Farms webinar archives page. And to hear more perspectives from Dr. Kaspar, tune in to Episode 06 of the Conservation Chat podcast! When it comes to monitoring water quality, there are quite a number of factors to consider: What are you monitoring for? How is land utilized within the targeted area? How, when, where, and for how long will water samples be collected? Under what flow conditions? The scale at which you monitor really makes a difference! The plot scale is valuable for looking at the impacts of specific in-field management practices. Plot scale (or field-scale) monitoring is where most of the pollutant export and delivery data come from that informed the Iowa Nutrient Reduction Strategy. Treatments can also be easily replicated on the plot scale. However, it’s challenging to properly scale up plot-level measurements to the area of practice implementation to truly assess water quality impacts across landscapes and with multiple practices. Monitoring on the watershed scale allows us to look at the collective impacts over a much larger land area. For instance, watershed-scale monitoring provides a broad picture of water quality challenges and aids in the identification of impaired waters. When monitoring on the watershed scale, measurements inherently include what’s happening on the land (field scale practices), plus field-to-stream transport, plus in-stream processes (bed and bank processes). It certainly provides a comprehensive look the big picture, but you can’t “sort” out the different contributions of what’s happening in-field versus in-stream. In between these two lies the delivery scale. Delivery scale monitoring occurs at the point where water is delivered to a creek or stream. For instance, with drainage research, this would be the point where the tile main surfaces and water empties into a stream. In a nutshell, the delivery scale reflects the direct water quality impacts from an agricultural area, minus the potential confounding effects of in-stream processes like bed and bank erosion. Here at the Iowa Learning Farms, we’d argue that this is truly a sweet spot for looking at the impacts of specific conservation practices. You need to monitor at the delivery scale if you want to know specifically what the agricultural impacts are. That’s exactly what we’re striving towards with the Conservation Learning Labs project. Within a small watershed area (several hundred acres), can we get a substantial percentage of producers adopting a conservation practice, like cover crops, and then measure corresponding water quality improvements at the delivery scale? Modeling suggests so, and this project will quantify what nutrient load reductions are actually realized thanks to large scale, targeted adoption of cover crops. Cover crops were seeded for the first time in fall 2017 within our two Conservation Learning Labs project sites. Stay tuned for results as we look at the water quality (and soil health) impacts of substantial cover crop adoption on the delivery scale! For Prairie City, IA farmer Gordon Wassenaar and tenant farmer Will Cannon, it’s worth using no-till and cover crops on every single one of their 1300 acres of cropland. In a field day hosted by Iowa Learning Farms, Jasper Co. NRCS and SWCD, Wassenaar and Cannon shared their perspectives on cover crops and how they can be very successfully integrated into corn and soybean cropping systems. Wassenaar, who has farmed for over 50 years, stated that he first got into cover crops for the purpose of protecting the soil from erosion. He started with cereal rye, broadcast seeded from an airplane. As time has gone on, Wassenaar’s reasons for using cover crops have evolved from simply erosion control, to improving the structure and functioning of the soil — raising soil organic matter, aggregate stability, and water holding capacity. Cannon commented that on top of that, another big benefit is feeding the biodiversity of the soil, like the beneficial mycorrhizal fungi, all while growing a healthy crop. Timing and seed-soil contact are two big factors with establishing successful cover crop stands, and it’s a balancing act between the two. Aerial broadcast seeding (or interseeding with a high clearance vehicle) allows for a larger window of time for fall growth, while drilling provides greater seed-soil contact. Today, Wassenaar and Cannon have moved to drilling all of their cover crops, ideally getting them in the ground 24 hours or less behind the combine. When asked about the financial considerations of cover crops, Cannon responded, “We’ve got to be willing to be a little creative and inventive to make it work.” And they certainly are. Shop around for cover crop seed. Compare prices with different cover crop seed houses in order to get the best bang for your buck. Wassenaar and Cannon are even considering growing their own cover crop seed down the road. Aerial broadcast seeding and custom planting carry a significant cost. Cannon explained that they have moved to seeding all of their acres now with a drill, which has provided greater seed-soil contact, and thus improved the seeding efficiency in terms of the number of seeds that actually grow (they’ve subsequently optimized/reduced seeding rates accordingly). They are also saving dollars through the use of a smaller 120hp tractor and a cover crop drill that was bought used. There are a lot of good programs out there that can help. Take a look at the conservation programs and personnel on the federal, state, and local levels that can help out. With years of experience implementing conservation practices of no-till and cover crops, Wassenaar reflected on how much the technology advances make conservation readily doable today. Sign up today for new Master Conservationist program! Interested in deepening your knowledge of Iowa’s wildlife and plant communities, broadening your understanding of biodiversity, and connecting the dots between agriculture, natural resources, and conservation issues in our great state? Look no further than the newly revitalized Iowa Master Conservationist program, launching this next week! Mount Pleasant will be hosting this pilot Master Conservationist program, running from October 5 – November 12, 2017. The newly refreshed Master Conservationist training program is being coordinated by Adam Janke, Iowa State University Extension Wildlife Specialist, in partnership with Henry Co. Extension and other local conservation personnel. The revitalized Master Conservationist program features a hybrid flipped classroom format, including both weekly online lessons and face-to-face interactive meetings. Themes will cover a broad range of conservation topics pertinent here in the state of Iowa, ranging from conservation history, biodiversity, forests, prairies, and aquatic ecosystems, to bringing it all together in the watershed and effectively communicating conservation. Each of the online modules will be led by ISU faculty and staff who are not just experts in their fields, but also highly engaging presenters. Participants will then meet in person weekly for the face-to-face training component, which will include interactive, hands-on activities and demonstrations led by local conservation enthusiasts, building and expanding upon that week’s online training. With numerous parallels to the Master Gardener program, the Master Conservationist program weaves together both learning and service in the local community. Don’t delay – get signed up today to be a part of this exciting new pilot Master Conservationist program! Spaces are limited, in order to foster an intimate learning environment, and today is literally the deadline to get registered. The cost is $100 and includes course materials plus a meal and/or snack for each of the seven weeks of training. Contact the ISU Extension and Outreach Henry County Office today at 319-385-8126. Considering the transition to rotational grazing? Wondering where exactly to start? Ruminate on the following tips and words of wisdom for getting started with rotational grazing, shared at an Iowa Learning Farms – Whiterock Conservancy joint field day this past week. 1. Build the system to what you can afford. Infrastructure considerations up front include fencing, water lines, tank/waterer system, and mineral feeder. 2. Start with a system that’s manageable for you. Pat Corey, NRCS (tenant at Whiterock/rotational grazing guru) recommends starting with a 5-6 paddock system, in which the cattle are moved once per week. That gives each paddock a 30 day rest period before the cattle return. 3. Scale up when you’re ready. Each initial paddock can be divided in half, resulting in a 10-12 paddock system, in which the cattle are moved every 4 days. 4. Be aware of herbicide residuals. Always read and follow label directions, and be aware of grazing restrictions – some herbicides have up to an 18 month residual. 5. Integrate cover crops for an additional spring food source. Let the rye grow big enough in the spring so there is good root structure in place to balance out compaction from the livestock. At Whiterock, cattle are out on the rye from approximately April 1 until May 15, providing an excellent supplemental food source in the spring months. 6. Try to maximize flexibility in the system! It’s all a learning process. Planning up front for the desired infrastructure, combined with active on-the-ground management, can yield a robust rotational grazing system, resulting in improved pasture productivity, reduced inputs, increased wildlife, benefits to soil health and water quality, and healthier herds overall.